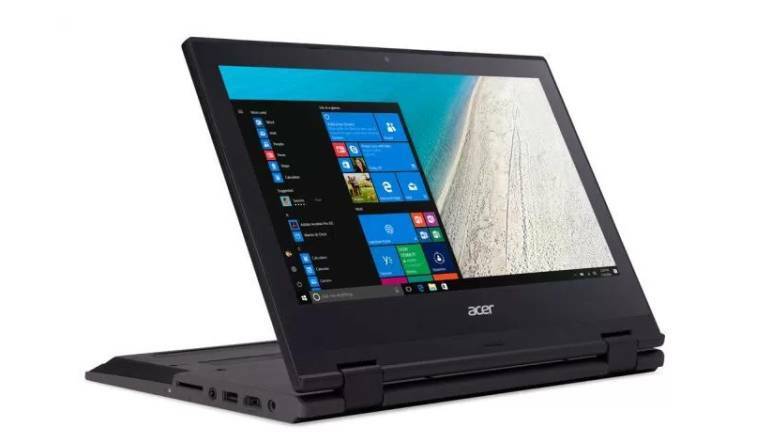 Do you remember those Spin convertibles Acer introduced in summer 2016? Well, now there is a cheap version of it just for students. The Acer TravelMate Spin B1 is a 11.6 inch notebook with a screen that can rotate for 360 degrees to convert it into a tablet. It comes with a robust body and a spill resistant keyboard which makes it perfect for students, especially the younger ones. The design of the Acer TravelMate Spin B1 is quite boring actually. It’s completely made out of plastic, has big bezels around the display and comes with a black color. It’s bezel is shock absorband though and you can even hit the screen directly without causing big damages. If you spill up to 330ml over the keyboard the fluids get directed away from vital internals to the outside. That’s quite useful, I ruined a notebook due to coffee once. Not only the design is unexciting, that goes for the internal hardware as well. The 11.6 inch display has a hd or full hd resolution, depending on the version you’re getting. Inside runs an Intel Pentium chipset but Acer did not specify the exact model yet. We also don’t know how much memory we’ll get. The battery life is pretty nice though with its promised 13 hours. One of the exciting things about the TravelMate Spin B1 is its stylus. Acer chips this convertible with an active stylus that supports Windows Ink. You get WiFi, Bluetooth and a couple of ports including two USB 3.0 ports, a USB 2.0 port and a HDMI out. There’s a slot for SD cards as well. Acer didn’t mention any prices so far but the TravelMate Spin B1 should be available in most markets starting in the second quarter of 2017. If you’re not into Windows 10 you could also take a look at the Samsung Chromebook Plus and Pro – two convertibles with Chrome OS.